On the 19th of April 2018 I received a message from someone that changed everything. It actually changed nothing at all, but everything at the same time, I just couldn't talk about it. We have tried many different ways to obtain proof, some actual evidence. People were tempted to risk buying something of his and then having it analysed, but nobody quite dare put that much money on the line and why should they? The police should be investigating this, not me and the others. We tried to force him into a corner to have his military records analysed but instead of taking us up on the offer, he spent thousands of pounds lying to a solicitor to have us all silenced. He is a public figure, making public statements and wants to sue the public when they question what he calls evidence. His deciet was shown to the solicitor and he was dropped by them. If Warren wants to take any of us to court he has to represent himself. However, the truth is never libel and the last place he wants this is in front of a judge, but that is exactly where I want it. He has made many threats to take us to court and still lies that he has done. No such thing has happened, but in doing this, the hope is that one day that will happen, just because it hasn't yet does not mean that he is innocent as Gary Heseltine keeps saying. He says that the title Conman means convicted. No Gary, it means confidence man or confidence trickster. We tried all we could but we didn't have anything solid. We needed physical evidence, we needed a victim, someone who has bought something and found out it was not genuine. Well we didn't get a victim, although there are many, all we could hope for was that someone will see these blogs and come forward. I know it happens... Because it happened last year. Contrary? Nope. On the 19th of April 2018 I got a message from one of Larry Warren's old friends. They knew each other from 1993 when Warren lived in Rutland, Vermont, to around 1999/2000 when Warren moved to England. "Hello. 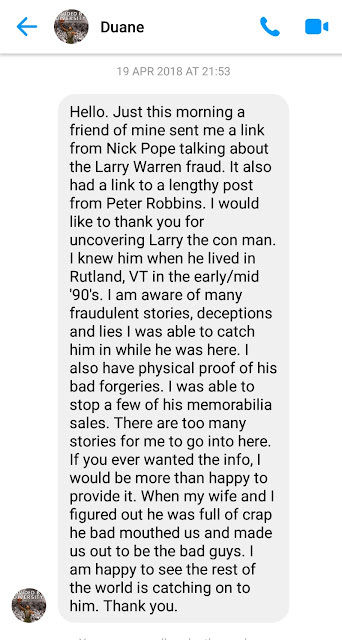 Just this morning a friend of mine sent me a link from Nick Pope talking about the Larry Warren Fraud. It also had a link to a lengthy post from Peter Robbins. I would like to thank you for uncovering Larry the con man. I knew him when he lived in Rutland, VT in the early/mid '90's. I am aware of many fraudulent stories, deceptions and lies I was able to catch him in while he was here. I also have physical proof of his bad forgeries. I was able to stop a few of his memorabilia sales. There are too many stories for me to go into here. If you ever wanted the info, I would be more than happy to provide it. When my wife and I figured out he was full of crap he bad mouthed us and made us out to be the bad guys. I am happy to see the rest of the world is catching on to him. Thank you". Duane and I have been talking since this time while saying nothing in public. The usual tactic is for them to start trying to destroy anyone challenging Warren's narrative. 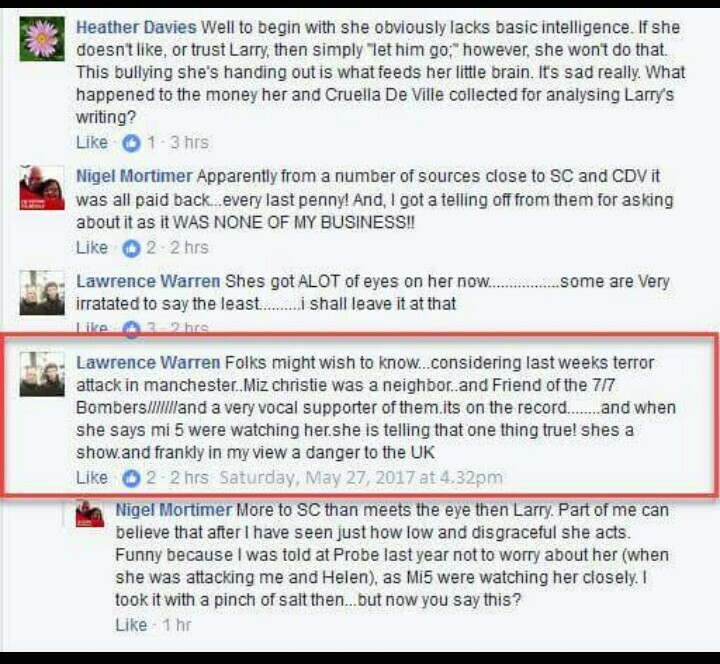 Not wanting to be embroiled in a spat, Duane has spent these past months creating two files of evidence against Larry Warren who lives here in Liverpool. 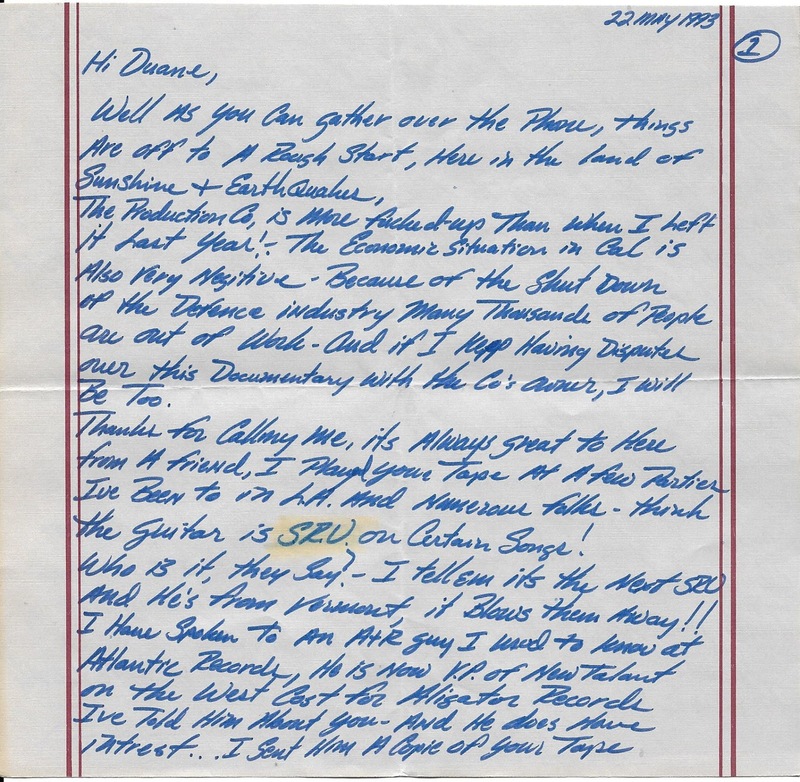 Not only does he have an actual item of memorabilia, he has letters of authentication and also a personal letter from Warren to Duane, who like myself, was his friend until he found out he was lying about who he knew and what he did for a living. Those of you who have followed this investigation will know that we were defeated in trying to have his military records examined and compared with his own handwriting. What we needed were actual handwriting samples, not copies of handwriting. Analysts need the original pieces. Warren was unwilling to do this even though we offered to pay for it and have him choose the analyst. We were thwarted then, but not now. Here is the evidence discussed in my show, Paranormal Mysteries on ANW, on Sunday 14th January 2019. I will embed the show when it is uploaded to YouTube. This show will be repeated Weds 17th Jan at 8pm GMT and Friday 9am GMT. Overseas listeners will need to disguise your IP address to make it appear as if you are in the UK due to the music licensing laws the network is bound to. An app called HOLA will do that for you. Hola download page. March 9 – Tuesday – DC meets Larry Warren at Marcia B’s Roadhouse while playing the members of Soul Kitchen in Rutland, VT Larry tells DC that he used to work for SRV. March 26 – Friday – Larry attends a Tin Pan Alley show at Marcia B’s Roadhouse that was a benefit. June 25 – Friday – June 26 – Saturday – Larry attends a Tin Pan Alley show at Gurey’s in Manchester, VT. Julie attends the Friday gig. On Saturday Larry acts as manager and books another gig there. June 27 – Sunday – Ben and Jerry’s festival in Sugarbush, VT. Larry talks us onto the tour bus with The Band and then takes me into Buddy Guy’s trailer. Buddy seems wary. We end up onstage for the show. July 15 – Thursday – Larry attends a show with the Heavily Bros. At Macleod’s Compass Rose in Rutland, VT. He gets into an altercation with someone named Charlie. July 22 – Thursday – Larry attends a show with The Heavily Bros. At Macleod’s Compass Rose in Rutland, VT. He again sings along with “Dear Prudence”. August 7 – Saturday – Larry attempts to take a large group of people from Rutland into a Blues Festival featuring B.B. King at Stratton Mountain, VT. He is drunk before the group leaves Rutland. He is stopped backstage with the group and taken to an office where he is asked who he is. He says he is the tour publicist. They inform him there isn’t one. We are told to buy tickets or leave. I am very angry with Larry as he had convinced me to sell my inside tickets because I wouldn’t need them. We have words in front of the group and part ways. August 13, 14 – Friday, Saturday – Larry attends shows at Gurey’s in Manchester, VT I recall that he acted strangely or suspiciously and drunkenly and on the way home showed me a gun. January 20 – Thursday – Larry attends a show with The Heavily Bros. At Macleod’s Compass Rose in Rutland, VT and is taking pictures. February 3 – Thursday – Larry attends a show with The Heavily Bros. At Macleod’s Compass Rose in Rutland, VT. He has befriended a local keyboard player and been telling him he would make him famous. I end up in a huge argument with the keyboard player as he tells me that I’m a loser and Larry’s going to make him famous. June 2 – Thursday – Larry attends a show with The Sandra Wright Band at The House of Blues in Cambridge, MA with girlfriend that my wife and I introduced him to. July 2 – Saturday - Larry attends a show at Macleod’s Compass Rose in Rutland VT. Larry gives me a SRV Backstage Pass and makes some sort of offer to XXXX. July 28 – Thursday – Larry attends a show with The Heavily Bros. At Macleod’s Compass Rose and give me pictures and shirts. I am unsure as to the specifics of this and suspect that it is a Charlie’s Guitar Shop shirt and pictures of one of SRV’s strats at The Hard Rock and/or signed SRV photos which he did give me also. August 10 – Wednesday – Larry attends a show with The Sandra Wright Band at Manny’s Car Wash in New York City, NY. He may have taken photos of us and I have a note that he behaved. 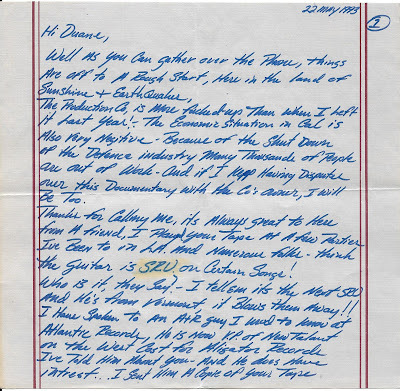 A handwritten letter from Larry claiming that he would make me famous and relaying that he would send me a picture from before SRV signed it (either the picture or the jacket signing was supposed to have happened during SRV’s tour with Robert Plant which occurred in 1988 (the jacket is dated 1986). A promo photo of SRV and Double Trouble alleged to have been signed by the entire band. All of their handwriting is the same and it is clearly very similar to Larry’s handwriting. A photograph of SRV and Double Trouble backstage allegedly signed by SRV. 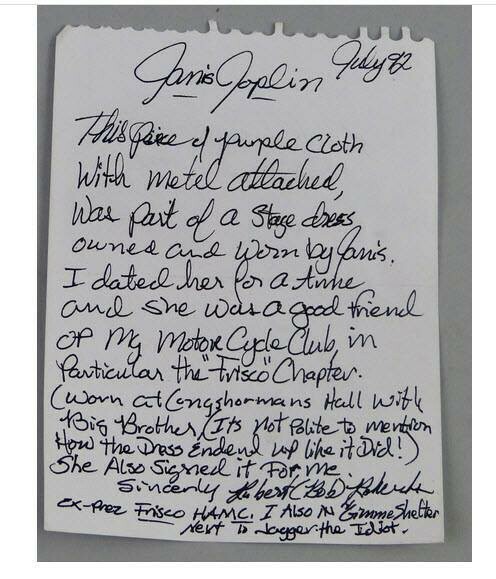 Also, similar to Larry’s handwriting and also SRV’s name misspelled. A t-shirt from Charlie’s Guitar Shop in Texas. Who writes their own initials in their coat after they have left school? Warren told Duane this was SRV's actual hat pin. Comparing the two pins you can clearly see that they are not the same. I can prove that I met him on March 9, 1993 as I have a date book from 1993 that I recorded things that happened at my gigs as a journal. I wrote on that day that I “met Larry Warren”. On March 25, 1993 I wrote that Larry had given me the jacket and the pin. 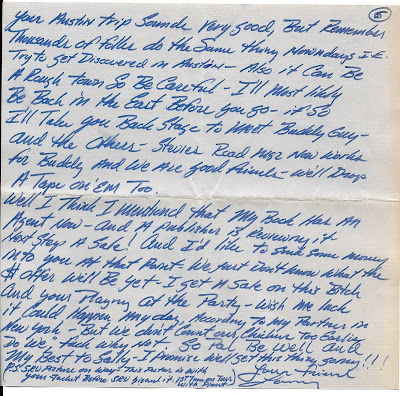 I can further prove that I definitely knew Larry as on May 22, 1993 he wrote me a handwritten friendly personal letter when he was allegedly in CA. In this letter he not only praises my musical skills but states that he will use his contacts in the music business and guide me to a major music career. He specifically mentions that he is going to send me a photograph of SRV and (presumably Larry wearing) the jacket before it was signed during the first tour SRV did with Robert Plant. I never received the photo but there is a photo of him found online appearing to be photoshopped next to SRV where he is wearing the jacket. Warren wearing the jacket in a very obviously faked photograph, awkwardly holding the guitar. Sold for $80,000.00 with an estimate of $250,000.00 (buyer was made aware). Bad hair day for Stevie, Ridiculous angle of the guitar, just so you can see the signature. Warren is wearing the jacket in all of the images of him. "I went over this item again with the owner of the company after he returned from his trip. 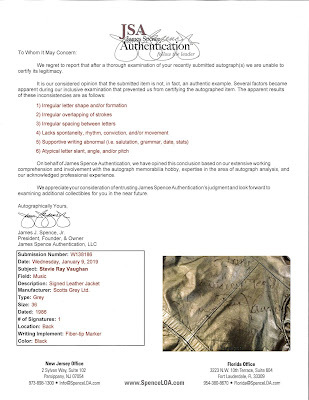 For extra confirmation, I also sent the jacket around to a few other consultants, just for additional feedback regarding the signature. 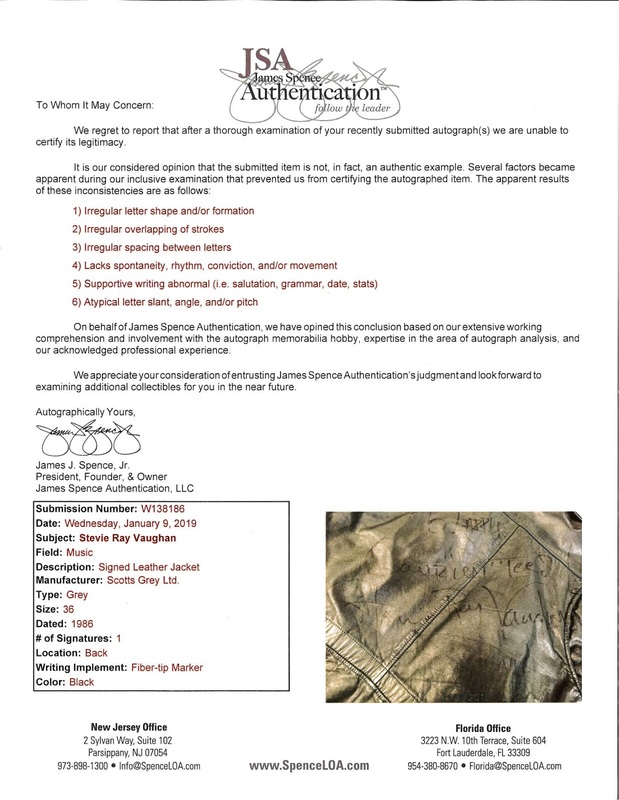 Everyone else I sent the signed jacket too also came back negative (a total of 9 authenticators and consultants took a look at this item, and none of them were in favor of the autograph). 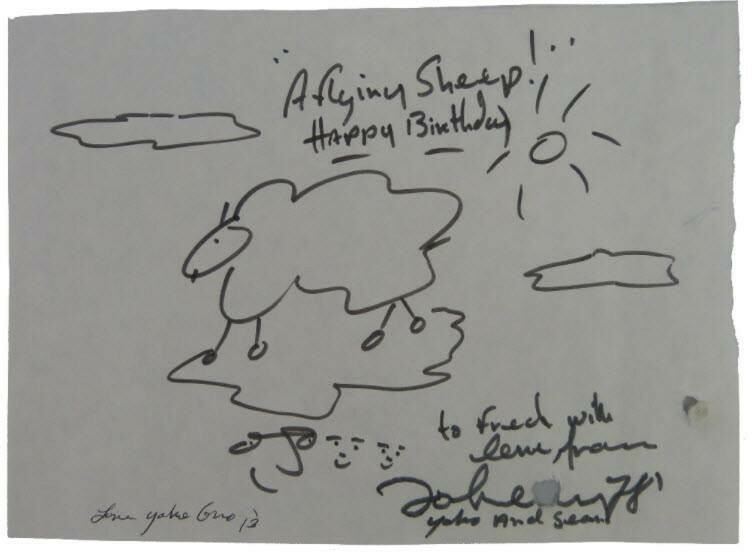 "This is pretty far off from our known, valid examples of SRV's autograph. There are several inconsistencies with letter formations throughout this entire example. Whoever signed this certainly gave it their best college try, but we do not believe this to be a valid example of SRV's autograph"
Just to clarify before we move on. A total of TEN authenticators looked at this jacket, ALL of them deemed it to be a FORGERY. We KNOW this was Warren's jacket because he is wearing it in all the forged photgraphs and mentions giving it to Duane in the personal letter written by Larry Warren. This PROVES Larry Warren forges memorabilia. Unfortunately and fortunately, Duane did not exchange money with Warren for the Jacket, the Cry Baby Wah Wah peddle or any items mentioned by Duane. If he had, this would be a legal matter now because we would have a sales victim. Warren gave these items to Duane to reel him in with flattery. Only16 days had passed between Warren and Duane meeting at that fateful gig, yet he had given him what would be priceless belongings, had they been genuine that is. I asked if the last reason was due to the word guaranteed being broken into three pieces: Guar”un”teed and that it was something that SRV never did and they said yes. However, I have located someone who has done that before. Larry did it in the handwritten letter he sent me where he wrote “At-tee-tude”. I feel that it is safe to say that since Larry clearly states SRV signed the jacket he gave me and it has been proven to be a forgery and there are clear similarities between the writing on the jacket and Larry’s own handwriting as well as his use of the unique habit of breaking words into three pieces, that one can conclude that Larry forged the jacket. Another problem is with Larry’s claim that there is a photo of him wearing it with SRV before it was signed on tour with Robert Plant. SRV toured with Robert Plant for the Non Stop Go Tour in 1988…not 1986 when the jacket is dated. In fact, a further issue is that Stevie’s last name is spelled wrong, Vaughn rather than the correct spelling of Vaughan. Larry also gave me a photo of SRV and his band Double Trouble that also has the same misspelling of Stevie Ray’s last name. 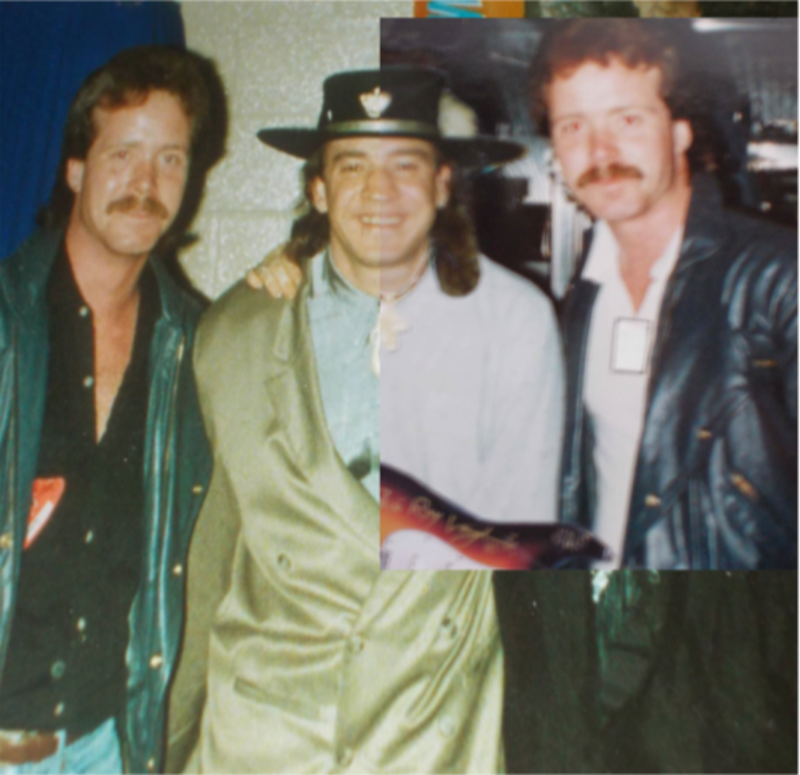 Larry also gave me a promo photo (above) of Stevie Ray Vaughan and Double Trouble he alleged to have been signed by all members of the band. In this shot, the same misspelling of Vaughan appears and all of the band members appear to have the same handwriting. 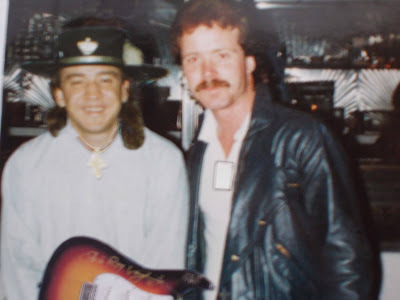 Spelling is something we will look at more, but at this point we have a handwritten letter from Larry Warren stating that his jacket was signed by SRV and given to me. We have SRV’s name misspelled on the jacket and the same misspelling on another item given to me by Larry and told that SRV signed it. It seems ridiculous for someone to believe that SRV didn’t know how to spell his own name but we will see that Larry is a very, very poor speller. Warren claimed to be at this gig, it is the gig he claims SRV gifted him the signed guitar. We will discuss this show more as we look at the allegedly owned and signed Stevie Ray Vaughan Fender Stratocaster that has been put up for auction several times. This item is one that bears scrutiny. I personally saw this guitar up close and in person. Larry told me that it had belonged to Jimi and since I was a big Jimi fan it was of interest to me. I had a book that listed a number of known Jimi owned and used guitars, amps and pedals listed by serial numbers and receipts. I informed him that the guitar was not one known to have been owned by Jimi according to the book. In 1995 a guitar alleged to have been owned and signed by Stevie Ray Vaughan was auctioned off by Christie’s. "This guitar was first sold by Christie's auction house in 1995, having been consigned on behalf of Larry Warren, an author of a book regarding his encounter with an allegedly alien spacecraft in a forest in the UK. 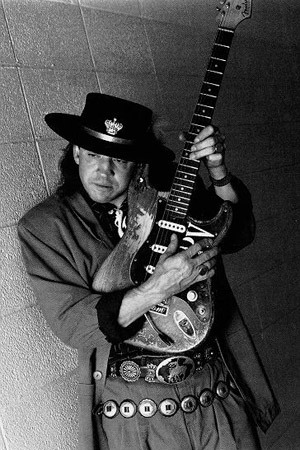 Larry Warren claimed to have obtained the guitar directly from Stevie Ray Vaughan. The serial number on a 1967 Fender Stratocaster is not under the neck plate. It is on the neck plate and certainly a guitar player the caliber of SRV and who is an ardent fan of Stratocasters would absolutely know this. Even if one were to try and claim that the neck plate had been changed to one that appears in a later auction of this guitar that was personalized, I don’t believe there is any incident of SRV replacing his Stratocaster neck plates with a personalized one. 2: Sunburst is one word and I am sure a guitar player of SRV’s caliber would also know this. 3: The letter alleges that SRV gave the guitar to Larry Warren on 7/3/1990. Stevie’s own guitar tech told the original purchaser he never saw the guitar and Stevie didn’t own it. 4: I was at that show and Stevie didn’t play that guitar for two songs in the encore. 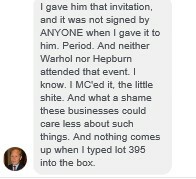 5: Larry admitted to the original purchaser that SRV didn’t play the guitar at the show even though the alleged letter of authenticity in SRV’s alleged handwriting says otherwise. This should be proof enough to the world that Larry is a liar and forger, but since it hasn’t been then one must ask, why would SRV lie about playing the guitar when he didn’t and why would he say that he played the guitar at Larry’s request when he did not? 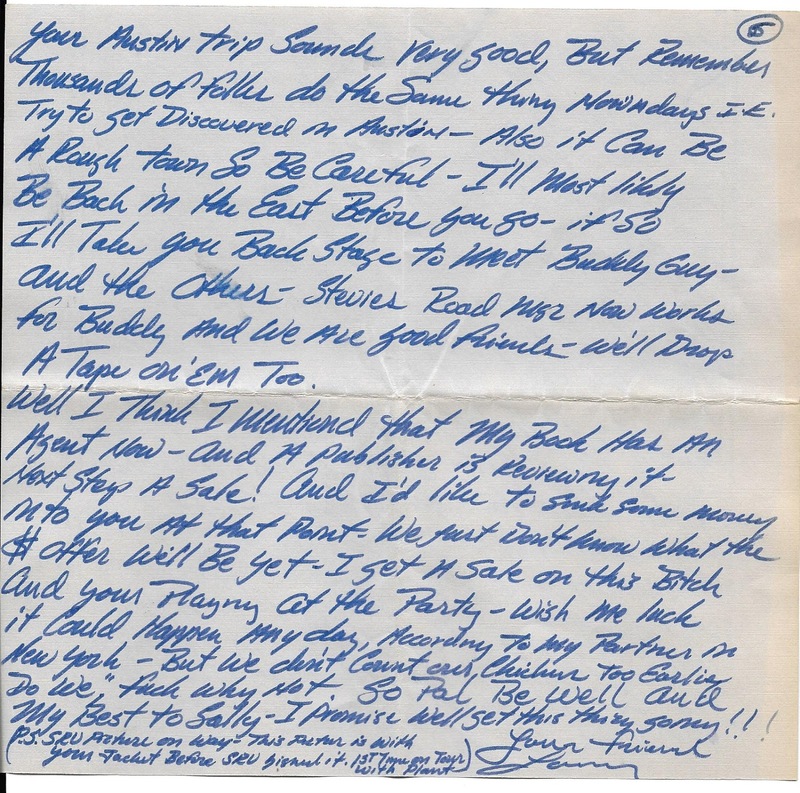 6: The letter states that Joe Cocker sang one of the two songs that SRV used the guitar on with him. As someone who was there I can state as 100% factually that Joe Cocker was the opening act but did not sing so much as a single note with Stevie Ray at that show. One must ask why Stevie Ray would write this when it never happened? 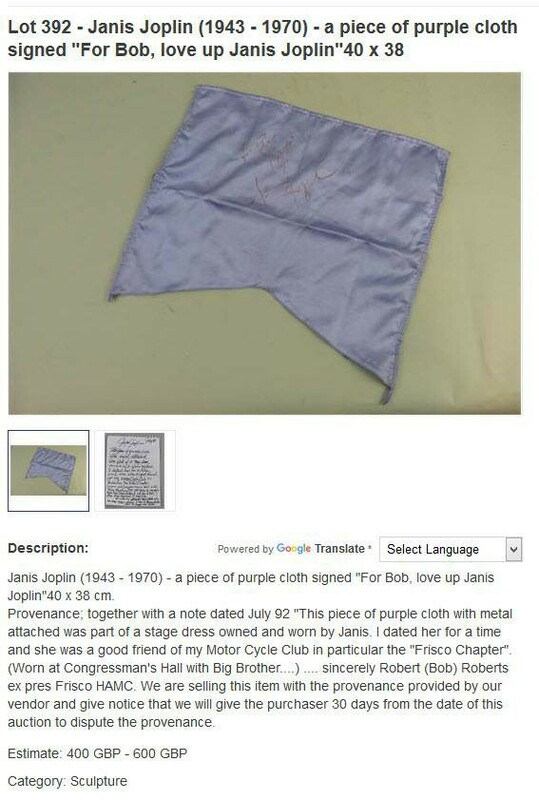 7: The alleged Letter of Authenticity brings up a “Hendrix” thing. It describes a hole in the lower horn that would have been from a strap button having been installed there. The guitar I saw in Larry possession in Rutland had that hole. For the record, when I saw that guitar there was no autograph on it, no stickers and no personalized neck plate. Also, I own a 1963 fender Stratocaster that had the same hole from a strap button on the lower bout. I never thought that Hendrix owned my guitar. After all, he was not the only left-handed guitar player in history. 8: Larry mentions the guitar in the Hard Rock Café. I submit that he is referring to the guitar he gave me the photograph of and that I believe he used as a model for the guitar he auctioned at Christie’s. 9: The signature has the weird little swoosh mark through the tail of the autograph which is the case with the one on the guitar. 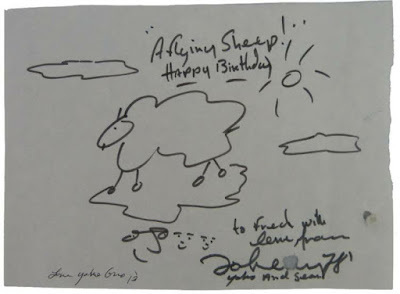 This does not seem to be a common part of Stevie Ray’s signature. 10: My suspicion is that Larry was nowhere near Essex Junction, VT on 7/3/1990. 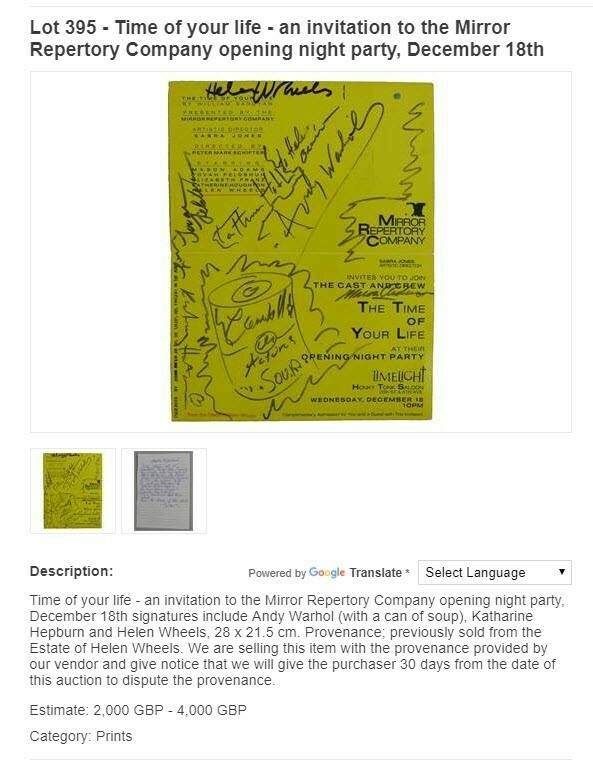 When he met me and quickly realized my passion for SRV he took advantage of that and he absorbed my story of attending the show into his own forgery to give some sort of detail to the Letter of Authenticity claims. I would suggest that since he claims to have saved so much memorabilia allegedly acquired from famous people that he would have some sort of evidence, such as a ticket stub, backstage pass, un-photoshopped photo from the show. He has not offered any of this. I would also submit that since it has been proven that the claims in the Letter of Authenticity are false and that it surely wasn’t written by SRV (not knowing where the serial number was, that he played the guitar on two songs during the encore and that Joe Cocker sang one of them). This would leave one to conclude that it is most likely that since Larry was selling the guitar and he was providing the Letter of Authenticity as proof and that the guitar was proven to be a forgery and the claims in the letter aren’t true one can only conclude that he forged the Letter of Authenticity too. Let me remind you that the STARTING price for it in 1995 was $125,000. 11: There is no evidence whatsoever that Stevie Ray Vaughan ever tried to play guitar left handed. This guitar was auctioned again in 2016 by Gurnsey’s where the asking price was $102,000. Stevie Ray Vaughan-Owned & Signed c. 1966-67 Fender Stratocaster. UNRESERVED. Serial#: 191460. Stevie Ray Vaughan owned and signed 1966-67 Fender Stratocaster in a three-tone Sunburst finish. The signature is broad and in gold ink, dated " '90," and also present on this guitar are some worn stickers; one group of stickers reads "SRV" and the other, located on the pickguard, is rather worn and faded but the word "Cobras" is visible. Vaughan played with Paul Ray and the Cobras in Austin, Texas from 1975 until 1977. This Fender's silver neckplate is etched in block letters "STEVIE RAY VAUGHAN DALLAS, TX." Paperwork inside the case with more of Vaughan's handwriting. Save to 'Saved Items' to access later. Guernsey’s says the guitar’s silver neck plate is etched in block letters “STEVIE RAY VAUGHAN DALLAS, TX,” and will be sold with paperwork inside the case with more of Vaughan’s handwriting. 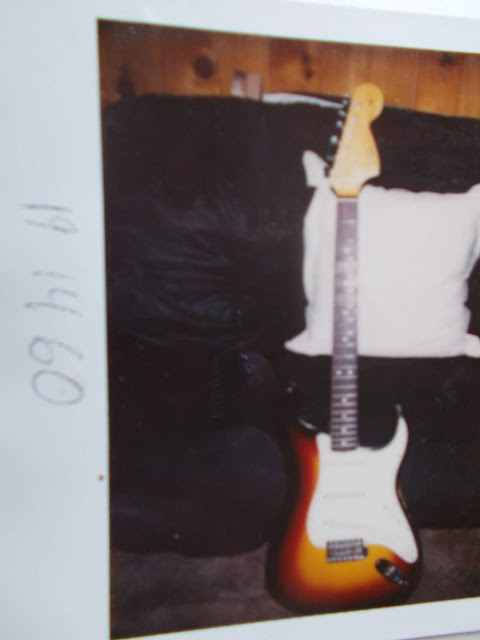 There is a podcast interview online with Larry talking about this guitar and claiming that it was stolen from him and that the signature is real and that it was not auctioned off by him. His claims are proven false because the original purchaser of the guitar is 1995 posted that he directly spoke with Larry about the guitar when he bought it as Larry was the seller. 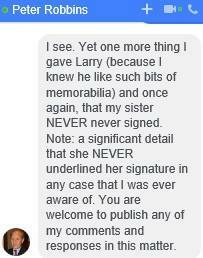 He specifically says that the signature is a forgery and Larry lied to him about it being played at the Essex Jct. Show and that he lied about there being photos of SRV playing it. I never believed that the foot pedal belonged to SRV as the handwriting here was too similar to the handwriting in Larry’s letter to me a year prior as well as many other reasons. At this point I would like to start dissecting and comparing documents connected directly to Larry Warren. Beginning with this document. One of the things that seems hard to swallow is that Rene Martinez makes the same kind of S’s as Larry…and SRV and apparently Tommy Shannon on a promo shot I received directly from Larry where all of the members of Double Trouble autographed it…and their handwriting is all the same. Note the small 'e' in 'Stevie' as well as Vaughan spelled incorrectly, “Vaughn”. You will begin to see that sometimes multiple versions of a letter are used in the same document. There is the same L used on the leather jacket which is a confirmed forgery. This last one is from an album Larry gave directly to someone in Rutland, VT and it was alleged to have been signed by all members of the Grateful Dead. How about the letter 'C'? You could compare letters all day long and find the same letter formations. As mentioned before, you can also find an awful lot of misspelled words. One in particular, “during” which appears across numerous documents as “durring”. It seems very strange that Rene Martinez, Stevie Ray Vaughan, Charlie Lennon and Larry Warren all don’t know how to spell the word “during”. 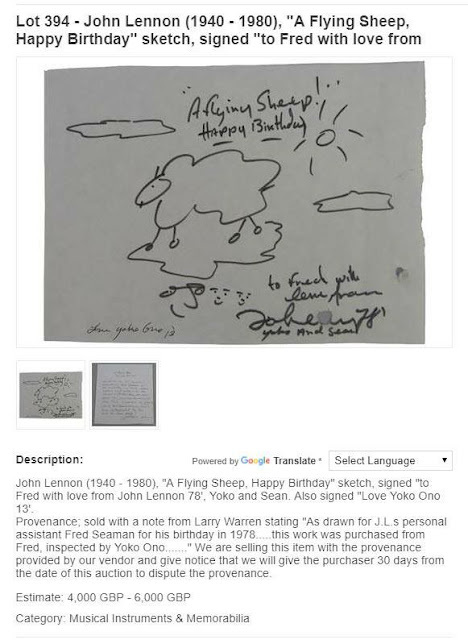 You could spend all day looking at letter formation across documents, look at how many times there is a combination of cursive and printing within documents, how many times handwriting changes within the same document (for example the mention of John Lennon prompts letter formation similar to his). There are certainly enough glaring things wrong with these documents for anyone to suspect they were all written by the same person. As Duane just said, you really can spend days on end finding problems with the various items included in this blog, but not only this blog but the many blogs about forged memorabilia that came before this tome. I encourage you all to do your own homework. Please feel free to use anything included in any of these blogs. Double check what I am saying, disect my research and Duane's, do your own analysis on the handwriting. I will at some point gather together the many and ever growing number of handwriting samples we have. We now have original pieces, I have more items coming to me in the near future. Apart from the very obvious forgeries you have seen within this blog, there are many more issues with other aspects of Larry Warren's life and what he claims to be the truth. Everything he says comes with a controversy, if you look closely enough you will find things I have, as yet, missed. Up to now Warren has told everyone that I am a drug addled nymphomaniac who abuses my children, that I have spent a year inside a 'nuthouse' or a 'mental hospital' in fact his exact words were "Ex nuthouse Inmate" just look at the language. You are an inmate in a psychiatric prison hospital, maybe, but certainly not in any psychiatric ward in this country or even century. Gary Heseltine parrots Warren's lies and adds his own to the crazy lady narrative. I am infatuated with Warren and that is all there is to this. There is no evidence against Larry Warren, and he should know what evidence is because he worked for the Transport Police. He says because he hasn't been convicted of crimes, he is innocent. He says this is all a fatal attraction thing. I am just a bunny boiler. You can make your own mind up, based on actual evidence, not the desperate gossip of a bunch of lying misogynists. This is all Sacha Christie's opinion Gary Heseltine recently stated on a thread on Grant Cameron's page. You can read that here. 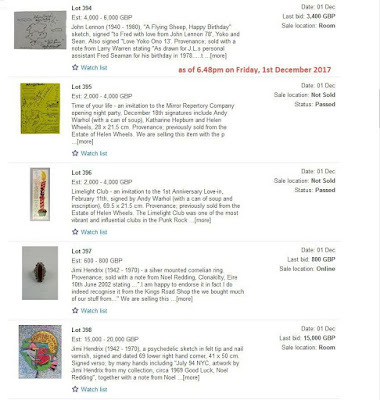 It's not my opinion Gary Heseltine of Ufo Truth (decay) Magazine and here is the evidence, official and backed up by a further nine other memorabilia experts. In September 2016 I was convinced I would be able to involve the authorities and tried to report these crimes to Merseyside police without success. They treated me like I have special needs, refused to take statements from me even though another constabulary wanted a statement to secure an arrest of someone who had threatened to shoot my friends family and cut off his nose, he then went onto say if you retaliate in any way I will do the same to Sacha Christie and he handed my address over to prove he had it. The police attended my address three times doing welfare checks when I wanted to make a statement to them, then finally sent an officer to my address who we believed would be taking a statement for Bradford Police. Instead she refused to take the statement and shouted at us for 40 minutes. A complaint to the IPCC was pointless, they couldn't even get the names of the people involved right and said they had investigated, they can only investigate after a statement has been made. They did no such thing. The police also told my local MP that they had investigated my claims and so he didn't help either. 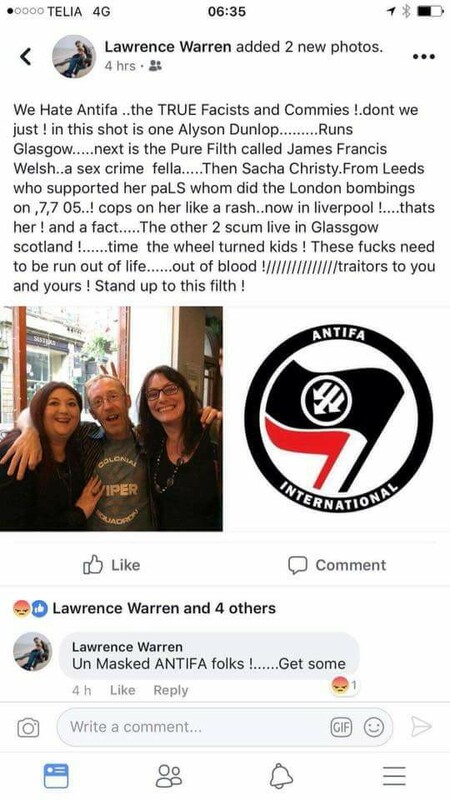 Then Warren said on one of his many radio shows which were just platforms for verbal assault, that he had family in the police here in Merseyside and of course, we all know he is keeping company with an ex transport police officer. Warren mentioning the fact he has family in Merseyside Police indicates corruption. Below are the documents I prepared for the authorities. They did not take them from me and told me they do not investigate fraud and that I had to inform Trading Standards which I did. Quite blatantly they haven't investigated him as he is still selling forged memorabilia on auction sites. A reminder of the official analysis that denotes this item is forged memorabilia. Larry Warren wants us to believe he is 19 in this photo. 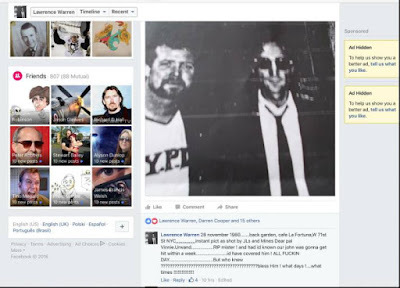 Blog re Warren Drunk In Live stream claims "I was PA to the Beachboys in the late 70's"
Note, she didn't even introduce herself, I found out who she was when I received the very ill informed IPCC response which dismissed me completely, the names were incorrect, the information within was not even true. Apparently if you are a part of the UFO and Paranormal community then you deserve everything you get, including being trolled daily by no less than 50 people. They would not use the Malicious Communications Laws and denied me my right as a UK citizen to report any of the crimes being committed. I was in fact abused by the WPC who attended in April to take a statement for Bradford Police but refused to, stating "I don't work for Bradford Police", also I was patronised by the other officers that attended who decided they needed to act as social workers rather than police officers. As you can see from the evidence I collated in the documents by September 2016, there are crimes to be reported. I estimate that since 2011 Warren has generated at least £80,000.00 from his fraudulent sales. There is probably more out there to find but I think I was throrough enough to warrant further investigation by the authorities. Since that time many more sales have happened. I stopped disrupting his sales and have allowed him to continue to commit crimes so that there will be something recent to prosecute him for. 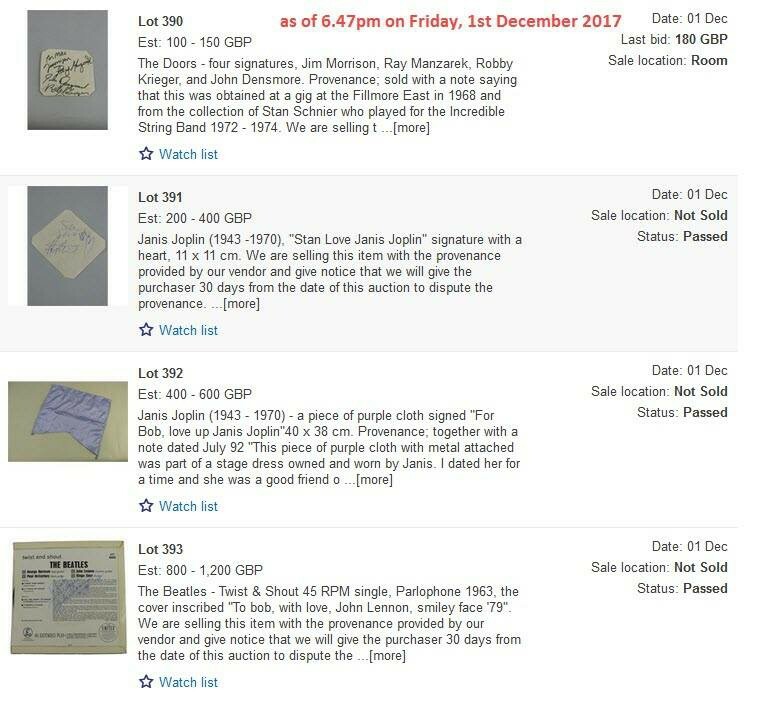 They include a Jimi Hendrix jacket for £15,000, a Jimi Hendrix ring for £8,000 and a Jimi Hendrix painting that I saw him paint, for another £15,000. 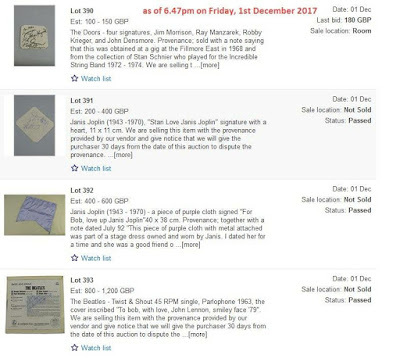 Other items in the auctions recently are John Lennon sketches and other assorted Lennon items as shown in the document titles 'Auction Items'. Some of his items were showcased on the BBC Look North News Rydale Auction Featured on BBC. I managed to alert the Auctioneer who actually wasn't impressed with me but i had forced the situation upon him by plastering the evidence I had on their Facebook page. They informed the attendees of the issues posted on their Facebook page and gave them a period of time to check. These items have been through several auctions, iIoutline them in the auction Items and Sales documents I converted into blogs. (posted above). It was also featured on the BBC Look North TV News show I think Sian Lloyd was the reporter. I haven't been able to locate that piece online, iIknow it exists though. I will continue to search. 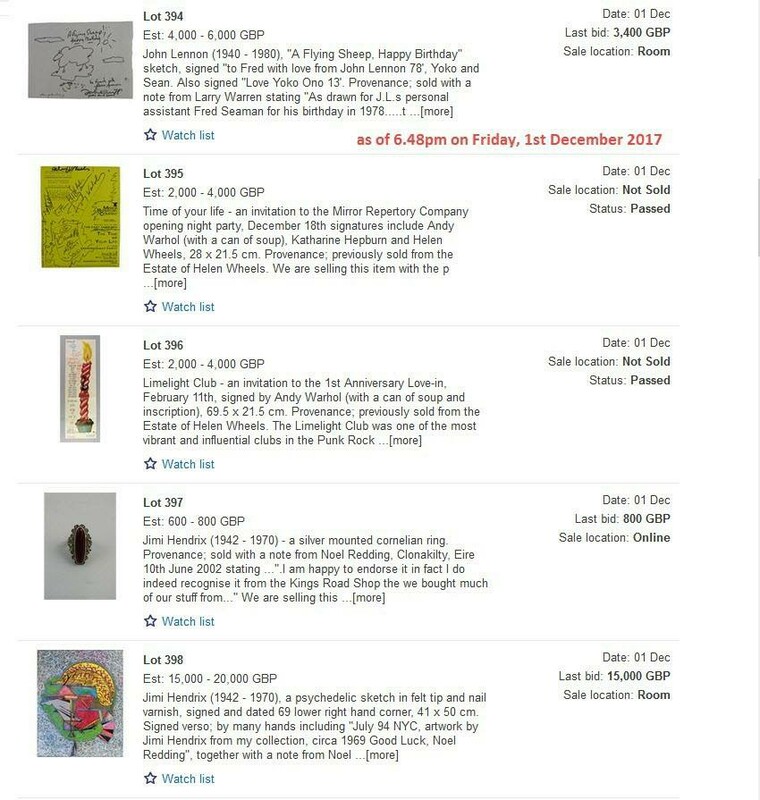 On the 1st of December 2017 I discovered these items for sale in yet another auction. I actually conferred with May Pang, who is John Lennon's ex girlfriend,who indicated to me which items were definitely not John's. attempts to contact Yoko Ono and Julian Lennon have been unsuccessful as yet. Efforts continue. There was a very significant reaction from Peter Robbins who was Warren's Co Author until Peter realised Warren was and had always been, lying to him. He discovered items that he had given Warren that were part of Peter's collection of sentimental items of his sister Helen Wheels. Helen died in 2000, Peter gave warren those items because he genuinely believed Warren would have some sentiment for them. A previous example re his spelling. He signed this himself. Everything goes back to him and it is all his own handwriting. As you can see the above items all look to have been written by Warren. Peter vehemently insists those flyers he gave warren had no writing on them. Not one signature. he can prove they came from his sisters estate as there is an official stamp on them. This was just last year, there have been sales since. Just so you know if you are an American living in this country (Liverpool) and you sell items online without an official business, you can get away with it. You can do anything you want to do. You don't have to pay Income Tax, VAT or Capital Gains tax. You can send death threats, hand out peoples adresses while connecting them to terror attacks without a single consequence. You can get together a big group of men to attack a person relentlessly and try and drive them to suicide just as Warren did to me, his full intention was to have me malfunction so dramatically that I couldn't even speak, to remove all my friends and support and hope that you catch the mind of a dangerous lunatic who would be another Mark Chapman as Warren mentioned many times. You will see from the other documentation I have provided that this is indeed the case. Duanes evidence underlines mine. You tell me... Am I just a crazy, ex nuthouse inmate, drug addict who is in love with Larry Warren who moved him into our home so I could have an affair with him under the noses of my parter and children? Or do you also think there is a very big problem here? If you do please feel free to contact Merseyside Police and tell them yourselves. 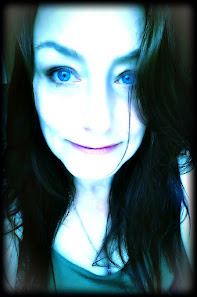 I am just a UFO nutter who shouldn't be listened to because I have had depression, I have ADHD and have had mental health issues which were post natal, I was post natally depressed when Warren moved in with us, our daughter was just ten months old when he moved in, she was 14 months old when the attacks started. Warren and his accomplices also falsely reported me for working while claiming disability benefits a total of four times. They also reported me to social services for abusing my children and being a drug addict. Think about that for a second. They tried to have my benefits stopped and my children taken from me. They failed. This was not considered to be harassment by the police. At some point I will redact the Independent Police Complaints Commission and post that online with the threats of death and harm in order so you can see how the police bunched many death threats and threats of harm into one complaint and ignored it all rather than treating each incident as a crime, which they were under the malicious communications laws that only seem to serve to protect politicians who have been parodied online. From let to right. Alyson Dunlop, James Welsh and Sacha Christie. Get some is a military term for killing people. This happened when I realised he had stolen Adrian Bustinza's account and said so in public. He said this because I said I was going to go to a conference he was talking at to ask him why his account was exactly like Adrians, verbatim. He was subsequently banned from the premises by Glasgow University. I was blamed for this and trolled for it. It had nothing to do with me. I wanted him to talk, I wanted to know what his narrative was. This was said when he had joined forces with Nigel Mortimer to have me run off the scene, this was when he was handing out my home address to the most undesirable people you can imagine. The show below is an Interview with Ronnie Dugdale who is Britains Leading Rendlesham Researcher. He is in contact with many of the Rendlesham Incidents participants and witnesses, some are public, most are not. He has an excellent insight into the events due to knowing pretty much everyone who has been involved in whatever capacity, during the events and afterwards in the 37 years of the many research findings since the events occurred. He will hate me saying it but it is the truth.